Pentecost Sunday is the Feast that the Catholic Church commemorates the descent of the Holy Spirit upon the twelve Apostles of Christ. Pentecost is celebrated seven weeks, or 50 days after Easter Sunday. 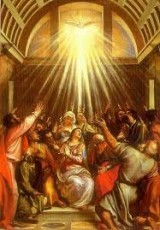 Pentecost always falls on the tenth day after Ascension Thursday. For many Christians, Pentecost is described as the “Birthday of the Church” since the Holy Spirit descended upon the twelve Apostles and they were commissioned to go and preach the good news of Christ to the four corners of the world. The Biblical narrative of Pentecost, where the 11 Disciples of Christ, Acts 1:13, 26, along with about 109 other individuals, Acts 1:15, including many women, among them was Mary the mother of Jesus, Acts 1:14, received the Baptism in the Holy Spirit in the Upper Room. In Acts 2:1-6, “And when the day of Pentecost was fully come, they were all with one accord in one place. And suddenly there came a sound from heaven as a rushing mighty wind, and it filled the house where they were sitting. And there appeared unto them cloven tongues like as of fire, and it sat upon each of them. And they were all filled with the Holy Spirit, and began to speak with other languages, as the Spirit gave them utterance. And there were dwelling at Jerusalem Jews, devout men, out of every nation under Heaven. Now when this was noised abroad, the multitude came together, and were confounded, because every man heard them speak in his own language”. While those on whom the Spirit had descended were speaking in many languages, the Apostle Peter stood up with the eleven, and proclaimed to the crowd that this event was the fulfillment of the prophecy, “I will pour out my Spirit”. Acts 2:41, “Then they that gladly received his word were baptized, and the same day there were added unto them about three thousand souls”. Peter said that this event was the beginning of a continual outpouring that would be available to all believers from that point on, Jews and Gentiles alike. Traditional interpretation holds that the Descent of the Holy Spirit took place in the Upper Room, or Cenacle, while celebrating the day of Shavout. The Upper Room was first mentioned in Luke 22:12-13, “And he shall show you a large upper room finished; there make ready. And they went, and found as he had said unto them; and they made ready the Passover”. This Upper Room was to be the location of the Last Supper and the institution of Holy Communion. The next mention of an Upper Room is in Acts 1:13-14, as the place where the Disciples and women waited and they gave themselves up to constant prayer; “And when they were come in, they went up into an Upper Room, where abode both Peter, and James, and John, and Andrew, Philip, and Thomas, Bartholomew, and Matthew, James the son of Alphaeus, and Simon Zelotes, and Judas the brother of James. These all continued with once accord in prayer and supplication, with the women, and Mary the Mother of Jesus, and with his brethren”. Although the Holy Spirit remains among us, an outpouring of the Holy Spirit will come again, In Acts 2:17 it reads, “And in the last days, God says, ‘I will pour out my spirit upon every sort of flesh, and your sons and your daughters will prophesy and your young men will see visions and your old men will dream dreams’.